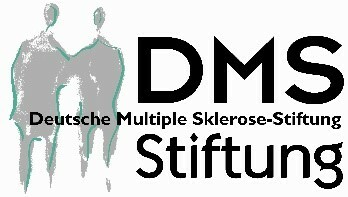 In 2001, the German Multiple Sclerosis Society (DMSG) initiated the installation of a Multiple Sclerosis Register (MS Register) for Germany. For this purpose, the MS Research and Project Development gGmbH (MSFP) was founded to manage the MS Register. In 2005, the MS Register started regular operations and has been continually developed and expanded since then. Most recently, more than 15,000 patients per year were reported by the centers listed by the DMSG. There was an average of two consultations per patient per year. Awards for (rehab) clinics and practices based on the guidelines of the DMSG, Bundesverband e.V. 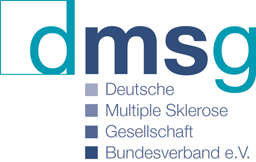 Participation in the MS Register of the DMSG, Bundesverband e. V. is a prerequisite for receiving the certificates "MS Center", "MS Special Center", and "MS Rehabilitation Center" awarded by the DMSG. They are awarded to university clinics, acute care clinics, rehabilitation clinics, MS outpatient clinics, and neurological practices if they meet the specified criteria. Adherence has to be confirmed every two years. The criteria catalog developed by independent MS experts focuses on a treatment based on guidelines by neurologists and professionals specialized in MS, as well as disabled access equipment of the facility. Depending on the type of center, a minimum number of MS patients must be treated per year in the centers. Part of these MS patients must be recorded in the MS Register. MS Special Centers thus must document at least 150, MS Rehabilitation Centers at least 80 or 120, and MS Centers at least 80 data sets per year.At the moment, the DMSG has decorated 67 centers as a "Specialized MS Center", 94 as a "MS Center", and 20 as a "MS Rehabilitation Center". The distribution of the centers over Germany is mostly homogenous, with a slight West-East and South-North gradient and clusters in metropolitan areas. You can find the exact distribution and number of centers here. In September 2018, the share of women with MS compared to earlier analyses remained unchanged at 72.0%. The average age was 46.6 (± 12.3), while the average age at the onset of the illness was 32.9 (± 10.7). On average, it takes 2.3 (± 5.3) years until MS is diagnosed. 74.6% of the documented MS patients have relapsing-remitting MS (RRMS), 15.8% secondary progressive MS (SPMS), and 5.7% primary progressive MS (PPMS). 2.1% had a clinically isolated syndrome (CIS) and 1.8% could not be clearly classified. 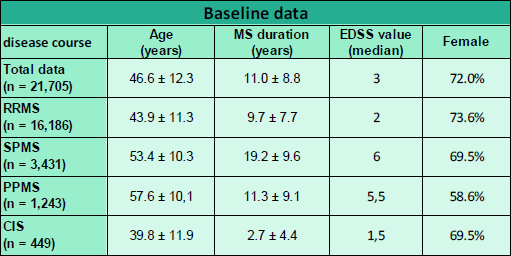 The severity of the disability (EDSS score) was on average 3.0. 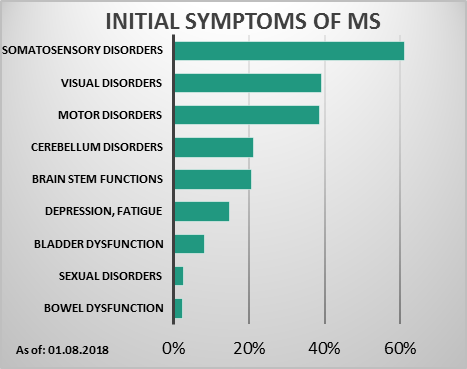 The following analysis, which was shown in September 2018 as graph of the month on the DMSG website, provides an overview of the initial symptoms of MS.According to this, 61.4% of the polled MS patients in Germany suffered from sensitivity disorders at the start of their illness. For 39.2% of the MS patients, the illness manifested itself in a visual disorder, for 38.8% motoric disorders in the form of weakness or paralysis were an early symptom. Symptoms that become increasingly important over the course of the illness, such as increased exhaustibility or bladder disorders, were rarer at the start of the disease. At ECTRIMS 2018, the MS Register was represented with a talk by Prof. Flachenecker and the e-poster "Disease Modifying Treatments (DMTs) in Germany – Changes in treatment patterns". The following illustration illustrates the treatment patterns for RRMS patients who received a DMT after 2006 but before 2011. The analysis showed that the availability of new treatment options has clearly changed the prescription patterns in Germany. Our analysis also showed that most patients are initially treated with interferons or glatiramer acetate in accordance with the guidelines. Depending on the duration since the first DMT start, secondary DMTs vary significantly. Interestingly, a significant part of the patients in all three groups (approx. 25%) did not change treatments. Since 2014, there has been a web-based, plat-form- and device-independent research database for the documentation of MS Register data. The research database is based on established tools and the concepts of the TMF e. V. for association research. It also makes it possible to integrate so-called patient-reported outcomes (PRO) for instance in the form of quality of life data that the patients document themselves via app or web. Using implemented value range and plausibility controls, the research database recognizes and reports incorrect information already at the time of entry. In addition, downstream quality control in combination with query management ensure data quality. The MS Register of the DMSG participated in the EUReMS project of the EMSP. This project was also supported financially by the EU and included partners from ten countries. 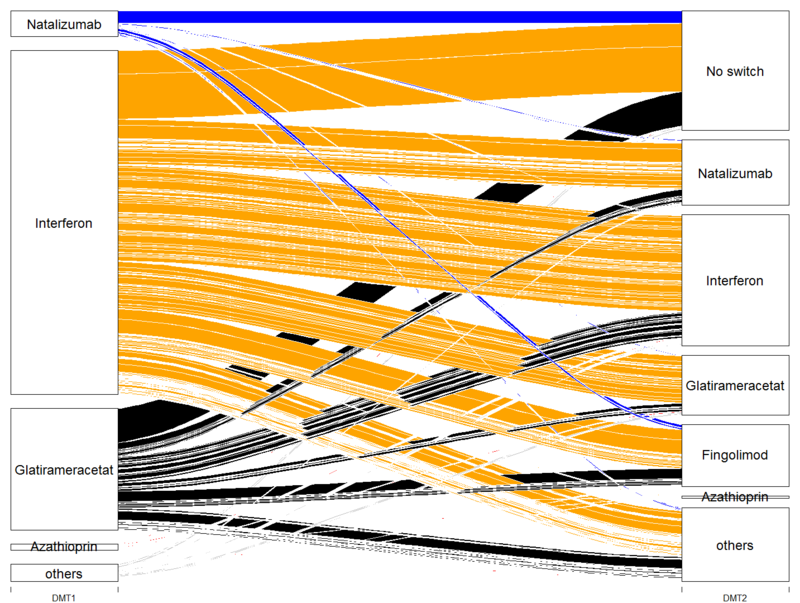 The main goal of EUReMS was to find an overlap of the different national MS registers in Europe. 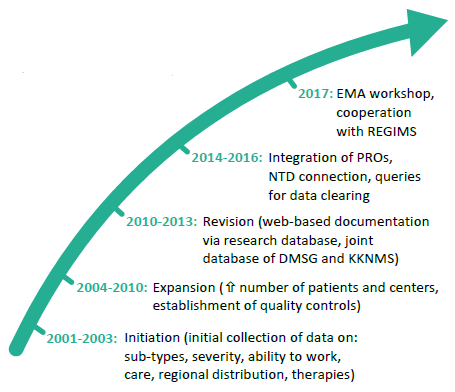 At the moment, the MS Register participates in the EMA Initiative on Registries, in order to enable the use of registers for questions of safety and efficiency of MS therapies in the future. Since 2001, the establishment and operation of the MS Registry has been funded by the German Multiple Sclerosis Foundation and the DMSG. 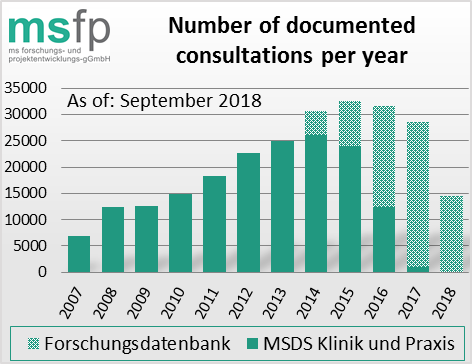 In 2018, MSFP received financial support from Novartis Pharma GmbH, Nürnberg and Merck Serono GmbH. The grants were dedicated for the establishment and conduct of the MS Registry and are used to implement the EMA recommendations of a harmonised registration form.